Hello fellow nail polish lovers! I'm beginning this week's blogging with a couple of questions to you all. 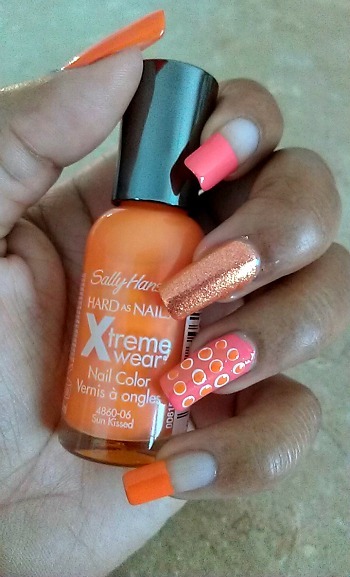 Do you remember the first brand of nail polish you've ever used? If so, what brand was it? This week's manicure prompted the question, as the stars of the week are both Sally Hansen Hard As Nails polishes. I am a big fan of Sally Hansen polishes and have been since I was a kid, since this is the very first brand of polish I have ever used. In fact, Sally Hansen and my beautiful grandma sparked my love for nail polish at an early age. When I used to visit my grandma, she had oodles of polishes displayed neatly in her bedroom on her dresser shelves. As I entered and exited her bedroom on numerous visits, I would just stand in front of the dresser marveling at the vast array of reds, burgundys, pinks, and gold polishes grandma had flooding the shelves. One day, she caught me eyeballing her polish collection and asked me if I would like to have a few bottles. At first, I was utterly shocked. I was only about 8 at the time (same age as my daughter) and I was a chronic nail-biter (also, same as my daughter). So, instead of giving her the opportunity to change her mind, I jumped at the chance to own my very own polishes. I grabbed a bottle of base coat (I believe it was the Love My Nails brand), a bottle of Sally Hansen Top Coat, and a beautiful fuchsia shade of Sally Hansen nail polish with a hint of iridescence that made them shine with hues of blue and green in sunlight. I was in polish heaven! Though owning these polishes didn't stop me from biting my nails, they did help me make the effort to quit for short periods of time. They also sparked my creative interest to free-hand nail designs, as I would go to the local Family Dollar and purchase the $1 press-on tips to let my imagination run wild on. If you have been reading this blog for a while, you probably know that I finally stopped biting my nails about two or three years ago. And though it sometimes seems that I go extreme by letting them grow so long, I guess for me it's just amazing to know that I am able to grow such long, strong nails just like my grandma had back in the day. 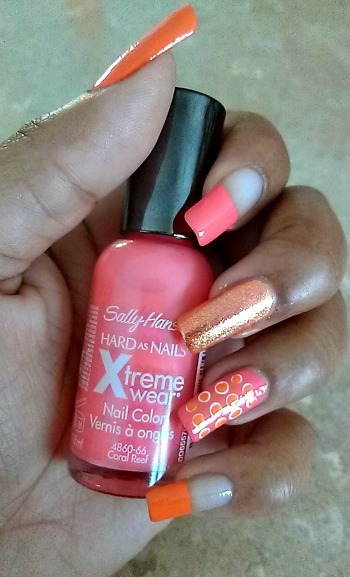 So while on my quest to find a new coral polish the other day (as I was inspired by Lynn's beautiful manicure last week and my old coral polish was too sticky), I came across this lovely Sally Hansen Nail Polish in Coral Reef and my mind went back to grandma for some reason. I smiled inwardly at the memory, grabbed the shade Sun Kissed as well (the prettiest, most opaque shade of orange I've ever owned) and generated ideas in my head for my next manicure. As you can see, I didn't get too creative. 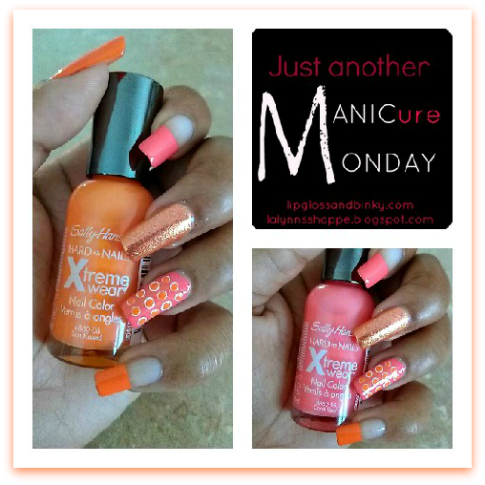 This is the same design from my last MANICure Monday post lol. I just switched the colors up. Here's everything I used. 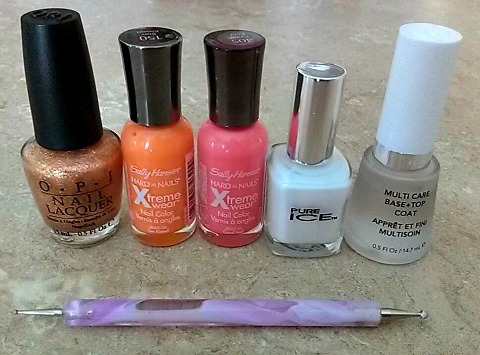 DO YOU REMEMBER YOUR FIRST NAIL POLISH?